Yarn Shop Day – This Saturday! This Saturday (3rd May) is Yarn Shop Day! Launched by Let’s Knit Magazine, Yarn Shop Day is part of their ‘Love Your Yarn Shop’ campaign and lots of yarn shops across the country are holding special events to help you get to know your yarn shop better. You can find events happening in your local area here. I’m lucky enough to have the best job a knitter can have, working at my independent LYS (local yarn shop), Stash Fine Yarns in Chester (I work part time and today is one of my days off, so don’t worry I’m not skiving!) and we’re really excited about the event we’re holding this Saturday! So what’s going on at Stash on Saturday? Louisa Harding is visiting us in the afternoon with a trunk show! She’ll be bringing a selection of her design samples from her latest books and will be available to sign her books too. Louisa has visited us before during her Himalayan Hiking Hats campaign to raise money for Macmillan Cancer Support and she’s really friendly and enthusiastic so I’m sure you’ll all enjoy meeting her. Andy from the Chester Wool Company (who supply independent hand dyers with undyed yarns) will be joining us too and he’ll also be bringing along some yummy Fyberspates yarns! We’ll all be demonstrating knitting techniques during the day, such as mattress stitch, magic loop, Jeny’s Surprisingly stretchy bind/cast off, Kitchener Stitch and more, there’ll be refreshments, goodie bags and a raffle. It’s sure to be a good day, so do come and join us if you’re in the local area. So why are local yarn shops important? Well, as a knitter, if you are lucky enough to have a local yarn shop they really are an invaluable resource and it really is a case of ‘use it or lose it’. Who knows, there might be one near you that you didn’t know about, so why not check here, or do an internet search on ‘yarn shop (insert your area/town/city here)’, you could be surprised! This can make all the different to your project, enabling you to pick the right yarn to really make your project sing. Plus, the more yarns you get to know, the easier it will be to choose the right fibres for your next project. Also if you want advice about whether or not the yarn you’ve fallen in love with will suit the project you want to make, you can get it, which brings me to my next point…. Yarn shop staff are as passionate about knitting as you are! We’re always interested in what you’re making and personally I love being able to give other knitters help with their projects. If you’ve bought a pattern at your LYS and you’re having trouble with it there is usually someone on hand who can explain that new cast on, or advise you why you need that circular needle and which length you should buy for the collar on that cardigan. You know how it is. You really love that pattern and you’re desperate to make it, but either the yarn has been discontinued, or isn’t available in this country, or just isn’t a yarn that you like (maybe you’re allergic to wool, or don’t the colour range). But you still have to knit that pattern. What to do? Why not ask for help at your LYS? We know a lot about our yarn ranges and can usually show you plenty of different options for suitable substitutions, and make sure you have the correct amount of yarn to complete your project (remember, you need the same number of metres of yarn, not the same number of grams, but don’t worry, we’ll do all the maths for you). If you fancy making a cardigan to go with that new dress, or a pretty shawl to go with a wedding outfit, or maybe you just want to see if that colour will really suit your skin tone, seeing the yarn in the flesh is essential! 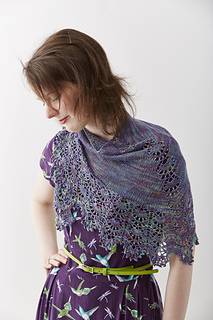 If you’re just starting out as a knitter, why not ask the assistant to point you in the direction of patterns suitable for your current skills? Most shops will have a range of patterns for all abilities. Whether you’re looking for a christening shawl or an Aran style sweater, if you ask an assistant to help you find what you’re after, you’ll save yourself a lot of time. Which yarn is more hardwearing? Will this one have good stitch definition? Which pattern is easier to knit? Which needles will suit my style of knitting best? Your yarn shop can help you with all these questions!